This section of the guide to MORTAL KOMBAT X, we will see where to find all the objects to fill the INVENTORY unlock the various areas of Krypt. - Welcome In Krypt! Use the MAP HOME until it is indicated another. - Open the three tombstones in the first cemetery to open the next gate. - Go In the right and enter the MAP GALLERY OF SPIDERS. - Continue Going up to the right and use the stick to overcome the chasm. You'll find yourself MAP ARAKNIA. - Follow The map to the right of the main hall and take the 'CLAW OF REPTILE - Passage of the Widow (6.30). IMPORTANT INFO: If you are in the MAIN HALL, one in which is inserted a red gem, and look on the left wall of the room, taking in front of you the portal with the gems, you can use the stick Raiden between 7 and 8 to reach a new area with other treasures. 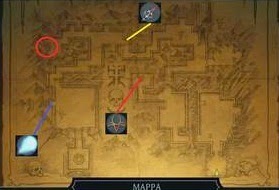 - Return Back and use the Sword just hold on the area to the north of the map. Unlock the access to a new area in which to collect the KATANA KENSHI - Shadow Spider (5.40). Head back into the first map of the Cave of the Spiders, where you have used for the first time the Staff of Raiden. - Go In the left and take the HAT KUNG LAO - Hall of Bones (-7.12). - Once Got yourself in the raised area nearby and take down the web with the Hat to drop the rock bridge. You will unlock a new area with the treasures. - Behind To the area where you took the Hat, you can use the web to return to the passage of MAP HOME. - Reach the building you see in the upper right of the map and go down the stairs to use the Katana taken previously. 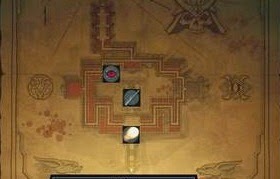 -You find yourself in MAP TOMB SHAO KHAN. Get off the stairs to find the BALL OF FIRE LIU KANG - Tomb of Shao Khan (0.6) in the center of the first area. -Go in the hallway to the right and go to the corner to collect PENDANT Ermac - Dark Passage (-5.18) on the wall of the alcove. IMPORTANT INFO: You can use the stick on the statue of Raiden Shao Khan that you find in this area to reach a secret area in which to open new treasures. -Expense and return to the MAP HOME, continue to collect LAUNCHES THE SCORPION - Via delle Anime (-13.19) from head impaled on the tree. - Reach the large area based on the map and take the ICE BALL OF SUB-ZERO - Frosty Trail (-21.20), from the small area on the left. - Climb up the steps to the Temple of the Lin Kuei with the entry-frozen to melt due to fireball collection previously. Here you will find other treasures. - Return now the MAP TOMB SHAO KHAN and unlocked the door in the central activating with the Pendant of Ermac lever in the right area, with the claw of Reptile lever in the north and with the ball of ice Sub -zero the last lever to the left. 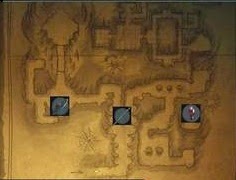 - Go to the central door and pick up from the center of the new area LAUNCHER OF JAX - Fortress Kahn (0.12). - Go to the MAP HOME and go up in the raised central. -Use the launcher to open the gate and have access to the statue of tenders. - Do you offer some tokens to the statue to get the KAMIDOGU THE UNITED HIDDEN - Shrine of the Dead (0.12). REMEMBER you can use this statue to obtain objects, the higher your bet the higher the value of the object obtained. - Go now at the point that you see marked by a red circle on the MAP HOME to always use the Kamidogu and reach the Dark Reign with other treasures to be recovered. 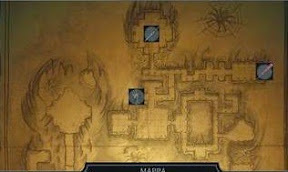 - Go finally in MAP GALLERY OF SPIDERS, you reach the area of the right and use the spear of Scorpion to cross the chasm. - In This new area you can get the last item in the inventory, the GEM OF SPIDER - WELLS SCORPION (18,10). - With This gem you can open the door mentioned earlier that you find in the main area of Araknia. Now you know all parts of Krypta and you have all the items to reach them, you just get the tokens needed to open all the graves with the treasures!